The German Institute of Navigation (Deutsche Gesellschaft für Ortung und Navigation e.V. - DGON) organized – in cooperation with the German Society for Maritime Technology (Schiffbautechnische Gesellschaft e.V.) 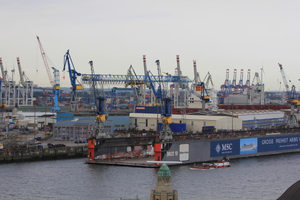 – the “International Symposium Information on Ships“, ISIS 2014, from 4 to 5 September 2014, high above the fascinating port of Hamburg. General topic of the conference was "E-Navigation". The traditional conference which already has been organized by DGON for the tenth time was opened Prof. Dr.-Ing. Reinhard Müller, University of Applied Sciences, Technology, Business and Design in Wismar/Germany, and Chairman of the DGON Scientific Advisory Council. Mr. Jan Reche (Federal Ministry of Transport and Infrastructure) and Mr. Michael Bergmann (President of CIRM) introduced into the conference, followed by 22 authors from Europe, Asia and North America who presented their research results. As chairmen of the several sessions acted - in addition to Prof. Müller - Dr. Volker Köhler, Ralf-Peter Lauck und Michael Hoppe. The authors from 8 countries explained approx. 60 participants of the conference the latest highlights of their research areas with fascinating and excellent designed presentations. The following animated discussions reflected the great interest of the audience in the research results. Breaks between the sessions gave sufficient opportunities for in-depth discussions and one-to-one conversations, whereby the maritime ambience with view of the busy harbour of Hamburg amburgand the excellent service of the hotel contributed to a relaxed atmosphere.